UDM Downloads > Syslog Watcher Personal Edition! 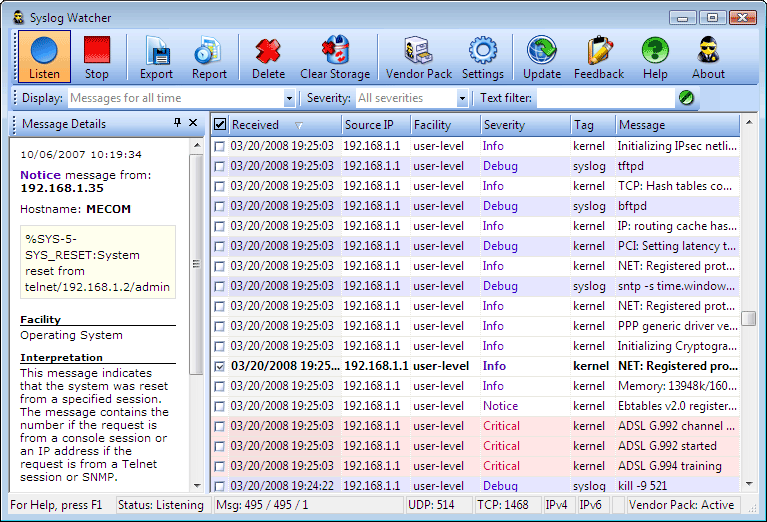 Free syslog analyzer for collecting and reviewing syslog messages from one network appliance. This syslog collector is an ideal choice for monitoring a home-LAN device (e.g.xDSL modem or switch) or testing purposes. Syslog protocol provides a wide range of system info. A need to monitor network events exists even in tiny networks with one active device, so Syslog Watcher Personal Edition will be an extremely suitable tool. Features and benefites: statistical reports, popup notifications, hex-view, IPv6, TCP syslogging (for firewalls), customable filtering and storing time, exporting to CSV or XML files, e-mail alerts. The most important features are intelligent parser of messages content and integration with Syslog Watcher Vendor Pack. The level of message interpretation supplied by these technologies essentially improves syslog messages analysis. Modern GUI style and many visual possibilities such as using different colors depending on severity provide a perfect appearance.